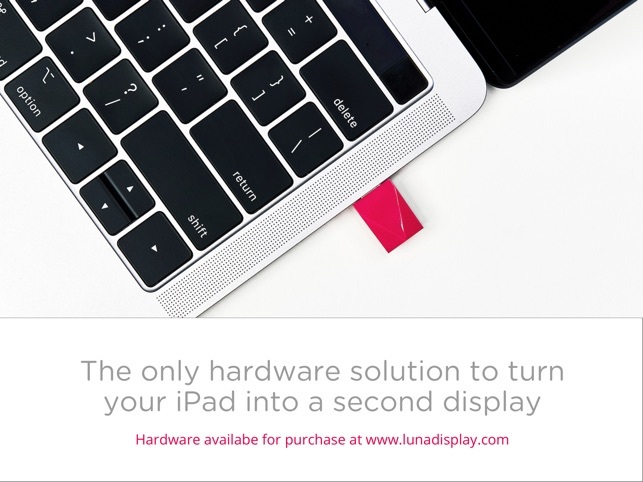 Luna Display is the only hardware solution that turns any iPad into a true, wireless second display. 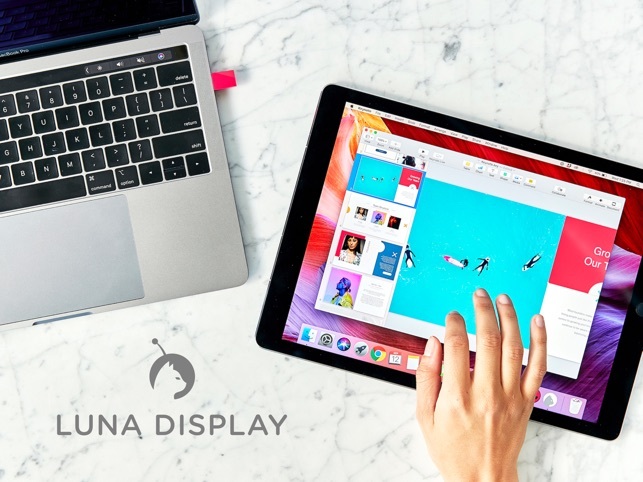 Luna Display seamlessly extends your Mac desktop to your iPad, creating a wireless second monitor with stunning image quality. 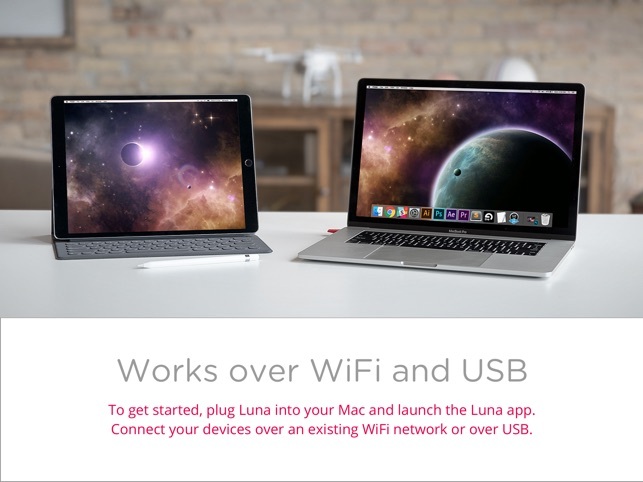 Available for Mini DisplayPort or USB-C, Luna sets up in seconds: simply plug Luna into your Mac, launch the Luna app, and you’re off and running. Hardware is available for purchase at lunadisplay.com. Powered by our unique LIQUID technology, Luna was designed from the very beginning to work wirelessly. 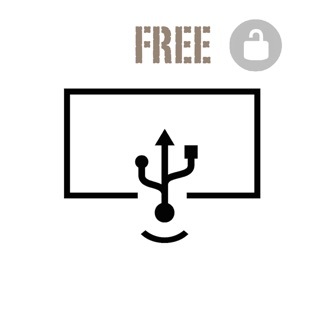 However if Wi-Fi is not available, you can also connect your devices over USB. · Luna requires a Mac running macOS 10.10, Yosemite (or later). For optimal performance we recommend these configurations: MacBook Air (2012 and later), MacBook Pro (2012 and later), Mac mini (2012 and later), iMac (2012 and later), Mac Pro (Late 2013). · Luna requires an iPad running iOS 9.1 (or later): iPad 2 (or later), any iPad Mini and any iPad Pro. 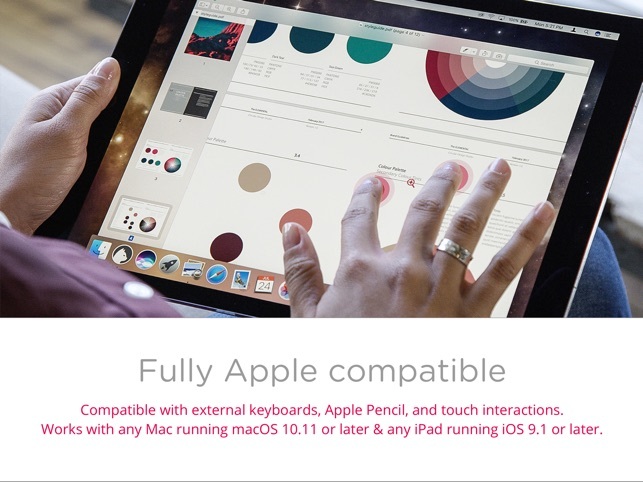 Luna fully integrates with our award-winning drawing software Astropad. Luna extends both Astropad Standard and Astropad Studio to provide the ultimate drawing experience with the best second screen solution for iPad. With Luna, you are no longer limited by the size of your Mac display. Using our proprietary LIQUID Technology, Luna Display provides crystal clear image quality, reliable performance, and wireless flexibility. Our latest update is all about optimizing Luna software and general bug fixes. - New support for mirroring: We’ve updated Luna so it will no longer reset your user preferences when you enable mirroring. - New diagnostics tools: We built two custom diagnostics tools to help us troubleshoot. Our connectivity tool is for if you experience a connectivity issue. The other tool is focused on checking your setup for any problems enabling Luna. These will help us better understand what you’re working with and find a solution that best fits your needs. These guys are fantastic; they really know good design! I guess that’s what you can expect from ex-Apple employees. The user interface & user experience is top-notch. I just tried my Luna out and it works great! Super responsive with very clear Retina graphics. I guess it helps that I have a good WiFi connection. It’s nice that the Luna app comes with a software tool to let you track the product performance in real time (latency, etc). Note that Luna on your iPad doesn’t work with pressure-sensitive styluses unless you also get the AstroPad product, which I already had. But when you combine Luna with AstroPad you can use the pressure-sensitive feature on your stylus and its an amazing experience! In that case, you open the AstroPad app on your devices rather than the Luna app. But thanks to the Luna app, with that setup you can continue to use your iPad as a second display. This really is the ultimate setup. It’s a great way to take your Mac and your iPad and combine them to have a touch-enabled drawing pad that works with Apple Pencil. And much cheaper than buying a Wacom drawing pad or a second monitor with touch/draw capability. I have only started using Luna Display for less than an hour, and I can already say that it’s the best second display app by far (over Duet Display I have used for more than a year). The quality of the screen is amazing especially for the Retina resolution. It’s so, so crisp 🤤. Text and photos look amazing on Luna Display. When content changes quickly, Luna chooses to maintain frame rate instead of the rendering quality, so you may see coarse frames for a brief moment, and that’s a fine approach Astro took. Color accuracy is insane. Photos on Luna look indistinguishable from photos on native iPad when looking at them side by side (with Slide-Over). I can see why artists absolutely love Luna Display for this. One big plus for Luna Display is that you can switch apps on iPad from Luna Display to another app, and then back to Luna Display again, and it wouldn’t lose the connection. I do this often as a developer. This is something that, so far, only Luna Display can deliver and such continuity feels so amazing. EDIT: this is actually not true. Luna will lose connection once iOS puts in in the background. However, this is not what Luna advertises. MORE EDIT: Luna Display almost always needs a cable to work well for me. This can be a drawback for many, but not for me personally, so I still enjoy Luna immensely. Thank you Astro HQ. I am absolutely in love with Luna Display ❤️. This is definitely better than duet. It supports retina, has a reasonable frame rate, and supports touch gestures. I love the Astropad app and use it frequently. 1) Despite what their webpage says, you cannot practically use this over WiFi. The frame rate is around 2 FPS and it takes a couple of seconds to send those frames over. The other two items in this list are when using wired mode only. 2) Even in wired mode, there’s still quite a bit of latency. It’s about a quarter of a second, which doesn’t sound like much, but it’s definitely noticeable when scrolling, typing, and moving windows around. Having retina on or off did not seem to affect this. 3. To maintain frame rate, the screen drops resolution. Sounds reasonable, however their method of downscaling ends up crushing text, making anything in the moving area (like a webpage) is completely unreadable until you stop moving and it has a chance to catch up. This is a minor issue, however, and doesn’t really mess up usability. I’d rather the app downscale than do what duet does and drop most of the frames. This definitely shows promise, and if duet could fix the latency issue over wired and adjust their downsampling algorithm to avoid messing up text I’d bump them up to a 5 star.